this upcoming Thanksgiving dinner may be the highlight of my month. yes, i'm working on my lit review. yes, i'm still doing my pilates workouts. yes, i know that there are more important things to think about. but the only words going through my brain right now are BROWN BUTTER. CANDIED BACON. PUMPKIN PIE. FREE FLOW WINE. it's embarrassing how many times i've texted dave a countdown to our thanksgiving dinner. i know the absence of family and friends (thank God for Dave!) will hit me like a rock on thanksgiving, so i'm especially thankful for something to look forward to. we've hosted the past two thanksgiving dinners, and i still love perusing for recipes (some eats i would be making if i were hosting thanksgiving: mains, sides, and treats to take home). but this year, it'll be a refreshing change to just show up for our reservation. hooray for an international thanksgiving celebration! operated by a company that offers walking food tours of Shanghai. 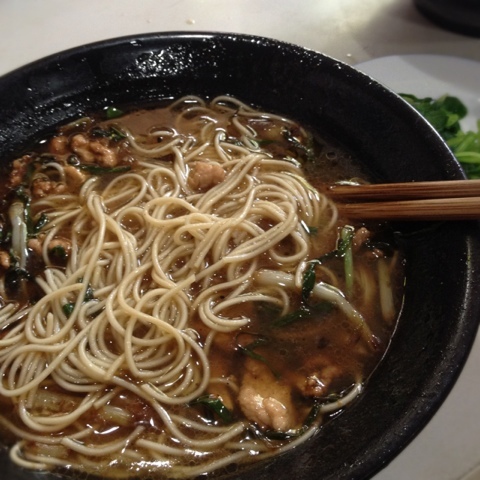 One stop on their noodle tour, Lao Di Fang, turned out to be a short walking distance away. There are plenty of hole-in-the-wall restaurants in Shanghai, but the good ones have lines out the door and menu items in Chinese characters only. This was no exception. We waited our turn to sit at one of the two dining tables in the restaurant, only to realize that webpage that I had loaded before I left listing the Chinese characters of the best dishes wouldn't open. After some pointing and a few helpful suggestions from the owner, we settled on a scallion and pork noodle dish, one with celery and eel, and a side of baby bok choy. I savored every flavorful bite, and the best part? Our entire meal was less than the cost of a latte at the local Starbucks, just over $4.